I like working in the street, in Venice people live in the street. So you can find some theatrical scenes like this one, and I like the way the subjects play with the architecture. The secret is this: we walk around and we pick up a corner, very carefully chosen, and that becomes the place where the best picture is. Leica CL with 18mm Elmarit, 1/250s f/2,8 iso 400. In a few days the Carnival in Venice will start and all the shops are preparing for the feast. This picture was taken in a narrow street, where by chance the light inside the shop was still off. So, I could get both the images, inside and outside (the reflection) in the same shot. Taken with Leica SL and 28mm Elmarit 2,8, 1/100s f/2,8. A vaporetto on its way in the North Venice’s lagoon. Winter is one of the seasons I like the most because it allows to go everywhere and often you can take advantage of a foggy day, and get a particular atmosphere, very suitable for black and white. I took this picture with a Leica Q and, of course, its Summilux 28mm f1,7. Wednesday the 28th November I’ll be holding a Leica Talk in FCF Photo & Video in Milan. I’ll talk with you about my personal approach to photography and my personal projects about Venice. Here we are, in one of the most hidden areas of Venice - forgotten by the mass tourism, after a 3 days full immersion workshop. I myself attended a lot of workshops as a student - many years ago - having as teachers photographers from Magnum and National Geographic, and now teaching and mentoring is a great way to help people in finding their own way. Everything is ready for the new edition of the Leica Akademie Discovering Venice with Marc De Tollenaere. A 3-days full immersion workshop, with a Leica M10 and 35mm Summicron, in the most beautiful, fascinating and hidden corners of Venice. The next edition will take place in March 2019! Leica Talk in the Leica’s stores. In the Leica Stores of Italy, I’ll hold a talk about my work in Venice. I’ll be in Milan on the 26th September, in Rome on the 27th September, in Bologna on the 28th September, and in Turin on the 22nd November. I’ll show a 20 years body of work, made with a Leica, in the hidden parts of Venice. I’ll take you inside this beautiful city, where its real heart beats. The Historical regatta is one of the most spectacular, engaging moments in the life of the city, able to enthuse and electrify the locals just as much as it fascinates the tourists. This is a picture taken many years ago, the first time I went to the Historical regatta. I never knew, up until that point, that the real hearth of the Regatta beats AFTER the pageant of sixteenth-century boats, when the race of "gondolini" (lightweight gondolas) takes place. In fact, the high point of the Historical regatta of Venice is the race in which the champions rowers measure up against each other and this is the most eagerly awaited moment of the whole event, the challenge that really sets the Venetian crowd alight and has built up the sporting legend of the regatta over the years. Photo taken with a Leica M6, 28mm Summicron and Velvia 50. I insinuated myself into this scene, asking permission first of course, and no-one cared about me as everybody was looking at the race. Fiora is a charming lady who lives in an heritage palace of the 15th century. When I first step into her house I was amazed by the incredible amount of objects, paintings, tissues, sculptures, books. She knows very well the timing for best light in her house, so she invited me at noon. Since then we became friends and I payed a visit to her several times. Every time there is something new to discover in one of the several rooms of the palace. Leica CL with 18mm Elmarit f/2,8. 1/125s f/2,8 iso 1600. Inside the Orthodox Church of the Greeks, Venice. I was trying the brand new Leica CL with the awesome 18-56mm inside this place I am very found of. There were extreme poor light conditions and I pushed the iso up to 3200, in order to use the zoom at 56mm f/5,6. The result is amazing. Though it's an aps sensor, the Leica CL stands out for image quality, and allows you to take pictures in every situations. I used the electronic shutter, no-one heard me. His shop is very funny, and he is very funny too. Normally he doesn't allow people to take pictures, but if you speak Venetian he will probably let you in. He works not far from the Scuola Grande of San Giovanni Evangelista in the district of San Polo and it really worth to pay a visit to him. Next time I'll need a barber I'll surely sit on this chair. Leica SL with 21mm Elmarit, 1/20s f/4 iso 800. ...I got a surprise: the fisherman's warehouse was full of everything. Not only nets, but a bunch of objects collected from old houses. When we pass in front of this place, we often stop to take a picture of the door, but it's really it's really difficult to find it open. While we stopped there, taking pictures, somebody entered and bought the poster of Hemingway you can see in the background. So, have a look at the picture and if you need for something, I'll show you where this place is! Picture taken with my Leica Sl and 28mm Elmarit-M lens. The first picture of 2018! This is a very beautiful area in Venice, not far from the Rialto bridge, but still not crowded. A mysterious hand painted this white lily on this wall, and in various other parts of the city. When I was going around Venice for the first Photo Tour of the year, I noticed the face o the first floor and I decided to split it in two parts, with one eye on the right and the other on the left of the central part of the window. I took this picture with my Leica SL, 1/6s, f/2,8, iso 1600. I payed attention to the exposure because of the high contrast among the sky, the interior of the first floor, and the outdoor scene of the palaces on the canal. Alberto Valese is an artist, expert in marbled paper. His shop is in Campo Santo Stefano, and we often pass in front of it during a Photo Tour, but his workshop is inside his house in Castello. So, thank to my friend Fiona, one of the best Venice's guides, I payed a visit to him. He showed us this ancient art in which he excels and it was incredible to see how time long it takes and how much skills to do just one piece of marbled paper! Completely different from the industrial production, and so amazing! As everything in made by hand, the production of Alberto Valese makes every single piece different, and with fantastic designs, like this octopus for an example! An incredible experience! Inside the Basilica of San Marco it's absolutely forbidden to take pictures, so what an honor to be called as the official photographer for a very important ceremony! My mentor David Alan Harvey, great photographer of Magnum, and my teacher of photography more than 10 years ago, used to tell me: "Remember that what happens immediately before or immediately after an event, is very often more important than the event itself". This is such the case, I got this picture at the end of the ceremony, when everybody was going away. I used my Leica SL, 90mm Elmarit M f/2,8, 1/25s f2,8, iso 3200. Welcome inside the Orsoni's factory! ...And here, I am presenting you the factory of one of the world's leading producer of gold mosaic and full body glass mosaic in Venice: Orsoni. The multicoloured panel, created as a sample collection of smalti and gold mosaic tiles. Mosaic starts its life through fusion, because it's created from fire, as with metals and crystal. This is why you will find brightly coloured stacks of melting pots at the entrance of the furnace. Throughout the history of art, mosaic has provided a truly fascinating medium. Mosaic was in use in ancient times, reaching its zenit in the celebrated romans decorations, and flourishing in Early Christian and Byzantine art. Some magnificent works were carried out in the splendid mosaics in the sights of Ravenna, in the Basilica of San Marco and the one of San Pietro in Rome, just to give you some examples. Mosaics in San Vitale, Ravenna. 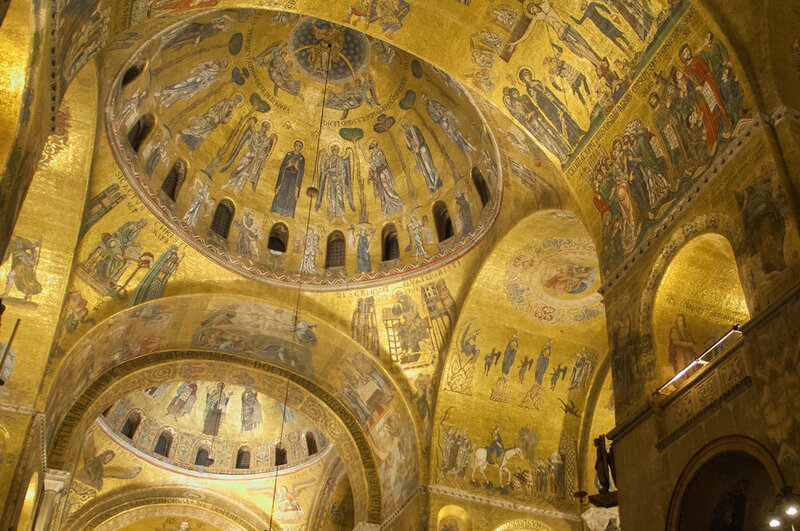 Inside the Basilica of San Marco. 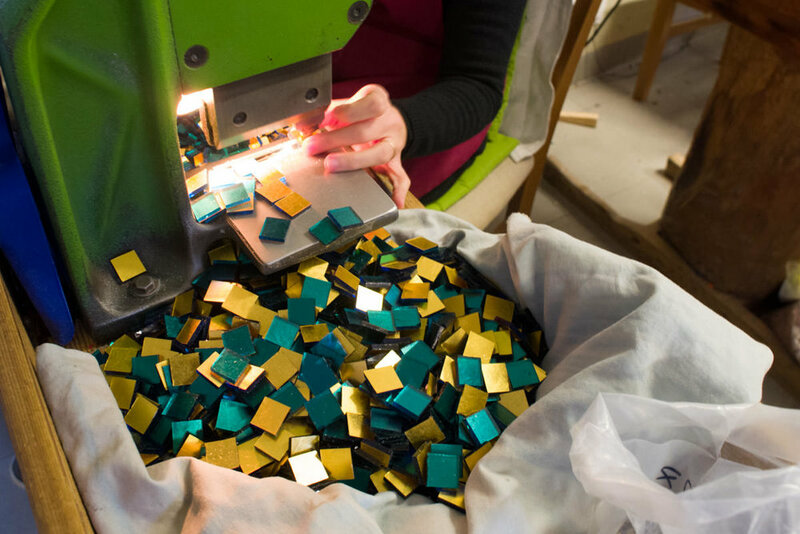 All small parts of the mosaic are cut by hand or using a glass cutter with a grill. In this way, you will obtain mosaics which are all different one from the other. Cutting the mosaic tesserae by hand. This is the link to the Orsoni factory in Venice. The new Leica SL allows you to see immediately inside the viewfinder the final crop in many different ratio: 3:2/7:5/4:3/1:1/3:1/16:9. I find the ratio 3:1 very useful because it if you want to shoot in panoramic mode, the frame is will not just be the crop of a 3:2 ratio, but it needs a different composition too! Here I used my Leica SL with a 21mm Elmarit, 1/80s f3,5 iso 800. Inside a glass factory in Murano. The making of the "Murrine"
It's always a pleasure when I am allowed to go inside a glass factory in Murano. For security reasons, these places are "off limits" for everybody, but sometimes I find a way through and I spend a morning taking pictures of very ancient art. This is the making of the glass cane that hides the colored "Murrine", the images or patterns made with glass. These patterns (since the Roman empire) will widely be used for making jewelry, glass vessels, jars, and so on. Picture taken with my Leica SL, Summicron 50mm, 1/200s f/2,8 iso 800. Inside one of the most artisan's beautiful workshops in Venice! This is my friend Max, inside one of the most beautiful workshops, where they build oars and oars-lockers for gondolas and other types of boats. During a Photo Tour, we entered inside this place and I saw him standing on this wooden box. I never understood why he was acting like this. Anyway, I quickly took a couple of pictures. By the way, I often like to take along my film camera, so this picture was taken with a Leica M6, 28mm Elmarit and Kodak T-max 400. Processed in Kodak HC110 1+31 (dil. B). This quiet area of Venice is a cross-road of history, art and legends. The house you can see in front of you belonged to Tintoretto, the famous Venetian painter who was buried in the near church of Madonna dell'Orto. Inside this beautiful, gothic, church, you can find some of his most famous paintings, including the "Presentation of the Virgin in the temple", dating 1552 which may recall, for the composition if not for the color, the other famous work on the same subject, by Titian, now in the Academy Galleries, and, on the side walls of the altar, two of his most celebrated youthful works (1546): "The Jews worship the golden calf while Moses on Mount Sinai receives the Tables of the Law", and "The Last Judgement". The white statue you can see on the right side of this picture, is the "Forth Moor", the servant of three rich merchants from Morea (Greece), who lived here. I used my Leica SL with 28mm Elmarit. 1/250s f/6,8, iso 400.